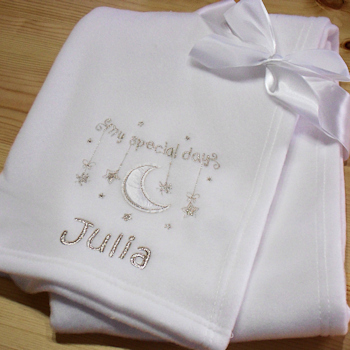 Personalised baby wrap blanket featuring moon applique with silver stars. Personalised baby wrap blanket featuring moon applique with silver stars. A special gift made just for baby for Christenings, Baptism, Naming Day or any special occasion. Baby blanket is custom made in England by Amys Gifts using lovely quality white antipil soft polar fleece with a blanket stitch edge and to one corner is an embroidered applique crescent moon and silver stars along with short wording or name of your choice. Baby pram size fleece blanket at 75 x 100cm.